When this recipe from Lindsey at Our Share of the Harvest popped up in my reader, I knew I needed to make it right away. 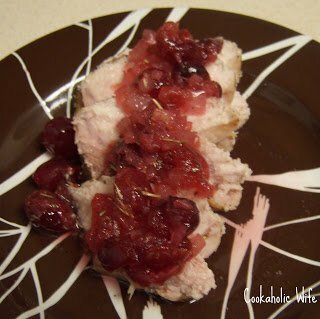 I love cherries and I’m always looking for new pork recipes. It was a perfect combination. 1. Season the pork with 1 tbs. of cilantro, the garlic powder and salt and pepper to taste. Cut the pork tenderloin into 2 inch medallions. 2. In a small bowl combine the ingredients for the salsa. Stir well and set aside. 3. Heat the olive oil in a large skillet over medium high heat. Sear the pork on both sides for 3-5 minutes or until golden brown on each side. 4. Transfer the pork to a plate and let rest for 5 minutes. 5. Spoon the salsa over the pork and serve immediately. I made some adjustments to this recipe, not grilling the pork (stupid apartment complex) and adding sugar and red wine to the salsa because I figured Tom wouldn’t eat it if it wasn’t sweet enough. He did end up liking it this way but suggested next time I use fresh cherries to make a sauce, not just a salsa. I thought it was delicious though!